The slump said it all. As Sam Dekker’s impossible 3 fell from the height of the shot clock through the bottom of the net, Rondae Hollis-Jefferson’s shoulders dropped. It was Dekker’s fifth — and the Badgers’ 10th — 3-pointer of the half, and with the lead now at eight, it was the final dagger in Wisconsin’s West Regional Final win over Arizona. After the shot went down, Badgers senior Josh Gasser turned to announcer Reggie Miller for some affirmation. “I said, ‘Sam’s got stones like you,’” Gasser said. “Kidney stones,” coach Bo Ryan interjected, trying to keep things family-friendly. All tournament — from Frank Kaminsky hitting SportsCenter in capri sweatpants to Nigel Hayes’s stenography fascination — it’s been obvious that no one has been having more fun than Wisconsin. Saturday was proof. This was a team that’s done it before and knew what it would take to do it again. This team can turn it up, and this time, it turned it way up. “That was cold-blooded,” Ryan said about Dekker’s dagger. “I can tell you that.” He was talking about one shot, but he could have been talking about nine others. No matter how Arizona tried to defend Dekker and Wisconsin in the second half Saturday, the ball was going in. “I think they had two 3s at the half,” Arizona coach Sean Miller said after the game. “Think about that. Two made 3s at the half, and they had eight in the second half.” When the moderator corrected him, it still seemed hard for Miller for believe. Wisconsin’s offensive display — 55.6 percent from the field, a scorching 12-of-18 from 3 — would be a sight against any team this deep in the tournament, but putting on that sort of show against Arizona made it all the more remarkable. The Wildcats were among the best defensive teams in the entire country, led by a pair of excellent wing defenders and defined by constant, stifling ball pressure. In the first half, Wisconsin was scraping for buckets on just about every possession. Kaminsky, as he had so many times before, was getting his against Arizona’s defense, but the rest of the Badgers went into halftime with only 17 of Wisconsin’s 30 points. Despite finishing with a career-high 27 points, Dekker was quiet for most of the opening 20 minutes. His seven first-half points came in unspectacular ways — an easy lob inside, a trip to the line, a lucky putback off a bad Kaminsky miss. It wasn’t the slashing, rim-attacking version who had a career-high 23 against North Carolina two days earlier. Twice after the game, Dekker brought up the challenge of finding lanes against Hollis-Jefferson and Stanley Johnson. And with Johnson on him for much of the first half, Dekker rarely looked to put the ball on the floor. What he did instead was put the final touches on his most complete weekend as a college player. Offensively, Dekker’s biggest limitation, both this year and last, has been his ability as a 3-point shooter. After hitting less than 33 percent from behind the arc as a sophomore, he checked in at 33.8 percent this season. His 5-of-6 showing on Saturday was comfortably the best 3-point performance of his college career. And when that shot is falling, it turns Dekker into a serious problem for any defense. The game he had against North Carolina saw Dekker taking anyone he pleased off the dribble. “[I] try to be an attack-first guy,” Dekker said Saturday. “I have the ability to use my athleticism. Sometimes I don’t use it the way I should, and when I’m in tune with that and doing it and using it to my advantage, it makes the game come a lot more smoothly and naturally.” At times against the Tar Heels, he looked like a 6-foot-9 running back, tucking the ball away as he barreled toward the rim. That’s a trick typically reserved for guys built like Derrick Rose, not small forwards with a wingspan pushing seven feet. Even with his ability to put the ball on the floor and finish, the best part of Dekker’s game is what he does without the ball in his hands. He’s a fantastic cutter, always moving and seeking out easy buckets. It’s the exact sort of trait that makes him so valuable to his team. At the same time, Dekker knows why a lot of those cuts are open to him. “It also helps to have this guy next to me getting a lot of attention,” Dekker said, nodding Kaminsky’s way. Dekker was named the most outstanding player of the West regional, but for the second straight year, Frank the Tank burned Arizona’s season down. Sean Miller’s team had no answer. 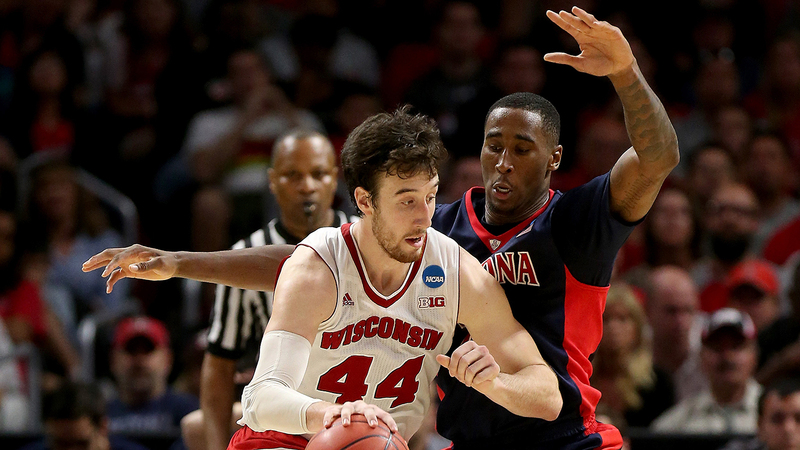 Three Wildcats tried their hands at guarding Kaminsky; none of them had much luck. Typically, a player with talents as varied as Kaminsky’s tries to find the perfect tool to take advantage of what a particular defender lacks. With his ability to handle the ball, opposing big men have little chance stopping him off the dribble. And with his ability on the block, smaller, quicker players just don’t have a chance down low. It’s gotten so Kaminsky doesn’t even think like that anymore. “I don’t really care who is guarding me at this point,” he said afterward. Concerns about whom he can guard — Kaleb Tarczewski had his way a couple of times on the block, and for all of Kaminsky’s strengths, quickness is not one of them — will persist as people ponder Kaminsky’s NBA future. But his sheer level of skill is remarkable. And it goes beyond being able to step out and shoot. At this point, he can do it all, against anyone. His game defines Wisconsin’s offense because of how he breaks defenses — even the best ones. Now, he and the Badgers will get a shot at the best defense anyone has seen in a long, long time. Kentucky is one of the only teams in the country better than Arizona on that end of the floor, and the difference between the Wildcats in blue and the ones in red is that Kentucky may have the array of big bodies to slow Kaminsky down.